Entry to all fixtures is currently free of charge. Instead we ask that spectators show their support by buying a match programme, entering the prize draw (you could win some cash) or by purchasing a drink from the club house. Running the club isn't free, so these other revenues are vital to our continuation. You can also show your support by purchasing a Spitfires Non-Playing Membership. SOUTHAMPTON SPITFIRES IS YOUR CLUB - WE WANT YOU TO BE PART OF IT. Here at the Spitfires we welcome all spectators to the club. It doesn't matter if you are a long standing Rugby League fan just out to enjoy a fix of your favourite sport or a new supporter who might be a bit nervous of coming down for the first time, everyone is welcome at Five Acres. 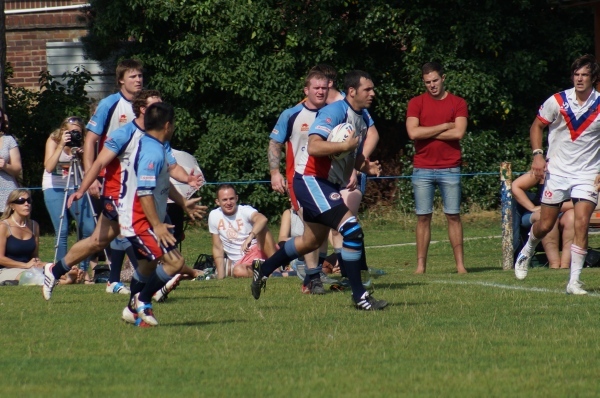 Spitfires is a community club which is growing in size and stature all the time and involving as many people as possible is one of our core aims, that includes attracting spectators from the local area. Rugby League is a tough sport with a great reputation as a family friendly entertainment and because it is played through the summer months we know you'll have a great time, hopefully in the sunshine! Come down on a match-day and we're sure you'll love it. What could be better than watching an excellent local sports product with great skill and ability on show, and the odd crunching tackle, whilst enjoying a refreshing drink, a bite to eat and mixing with other fans and club members?! So, next time we're playing at home you're definitely invited! The game will speak for itself, we're confident of that, but we think you'll also have a great day out with us. We look forward to seeing you at kick off and in the club house afterwards!